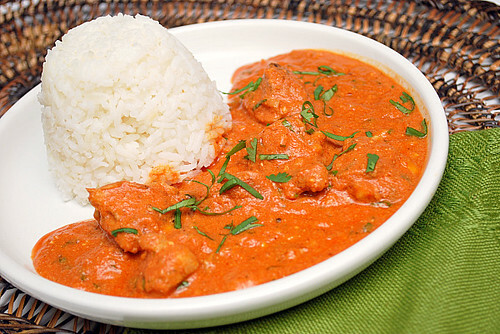 When you see 'Butter Chicken' on an Indian restaurant menu, you might envision a greasy chicken dish if you're not familiar with it. However, this dish is far from greasy. In fact, it's extremely flavorful and one I find especially comforting when served with steamed basmati rice. Tender chunks of juicy chicken thighs are seasoned with garam masala and a pinch of cayenne pepper before being sauteed. Meanwhile, a rich tomato sauce simmers with hints of lemon juice, garlic, ginger and a myriad of spices (such as garam masala, cumin, chili powder and bay leaf). The browned chicken is added to this sauce along with half & half, a bit of yogurt and chopped fresh cilantro. Just before serving, ground cashews are mixed in to thicken the sauce which also adds a subtle nutty flavor. It's an aromatic dish with a bright color that sure to please! If you like your Indian dishes to be on the spicier side, increase the amount of cayenne pepper. Lastly, if you happen to come across ground fenugreek, add a 1/4 teaspoon to the sauce for a special, more authentic touch! Press SAUTE on the IP and add 1 tablespoon vegetable oil. Add chicken and season with 1 teaspoon garam masala and cayenne. Cook until lightly browned, about 10 minutes. Remove from IP and set aside. While on SAUTE mode, add remaining 1 tablespoon vegetable oil. Add onion and saute until soft and translucent. Stir in butter, lemon juice, ginger, garlic, garam masala, chili powder, cumin and bay leaf. Cook, stirring for 1 minute. Add tomato puree and cook for 2 minutes, stirring frequently. Stir in cream or half-and-half, yogurt and cilantro. Add the browned chicken and simmer for 10 minutes, stirring frequently. Season with salt and pepper to taste. Just before serving, add the ground cashews and stir. Serve over steamed basmati rice.